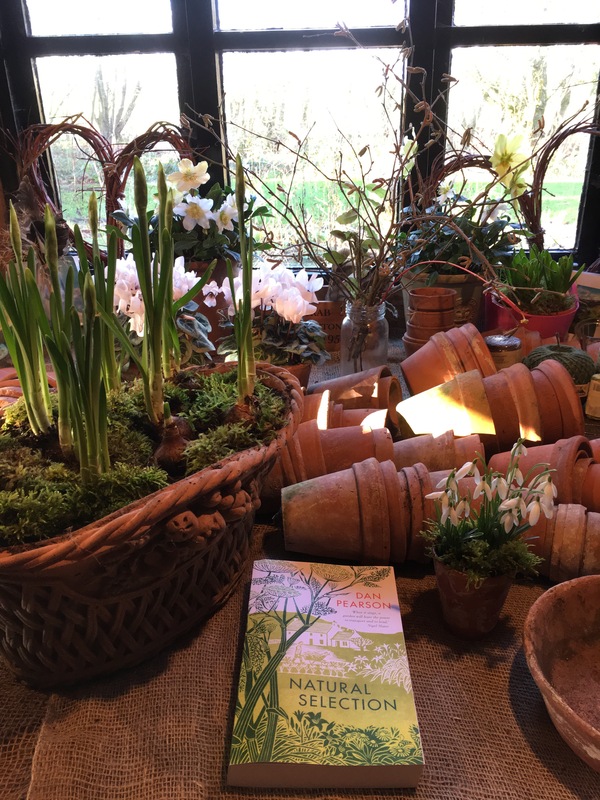 All winter I’ve found a kind of sanctuary in the potting shed. There’s a deep peaceful silence. A protection from the cold. A place to think. I can plot the progress of the seasons from the pottingshed window. 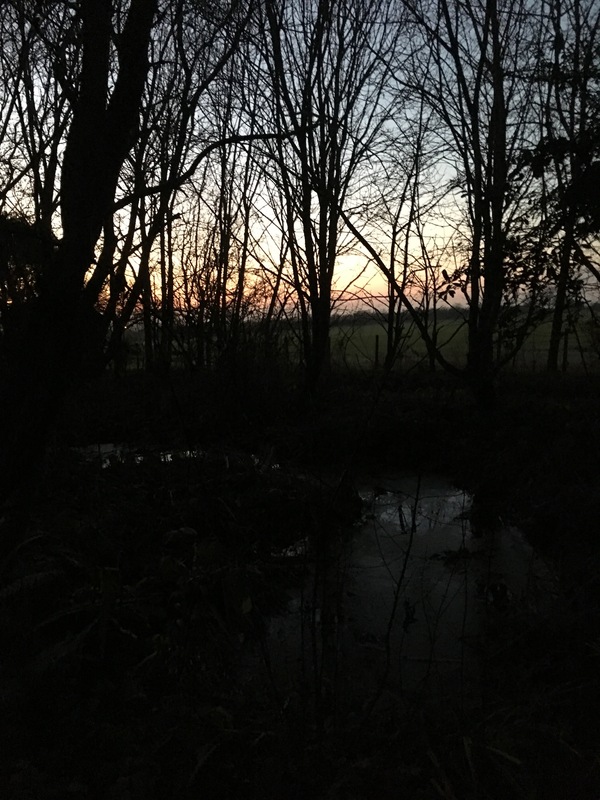 Just now I can see gaunt willows bordering the pond. They look like charcoal drawings. I think of my farming ancestors who would have lopped the willows to make sheepfolds at this time of year. I’m fascinated by old farming almanacs. My grandmother used to read them and occasionally I’d hear talk of Imbolc and Candlemas, mentioned in the first week of February. Imbolc meaning lambs milk or the start of the lambing season. And Brigantia, the Celtic female deity of light, St Brigid in the Christian tradition, calling us to celebrate the sun – halfway on its advance from winter solstice to the spring equinox. 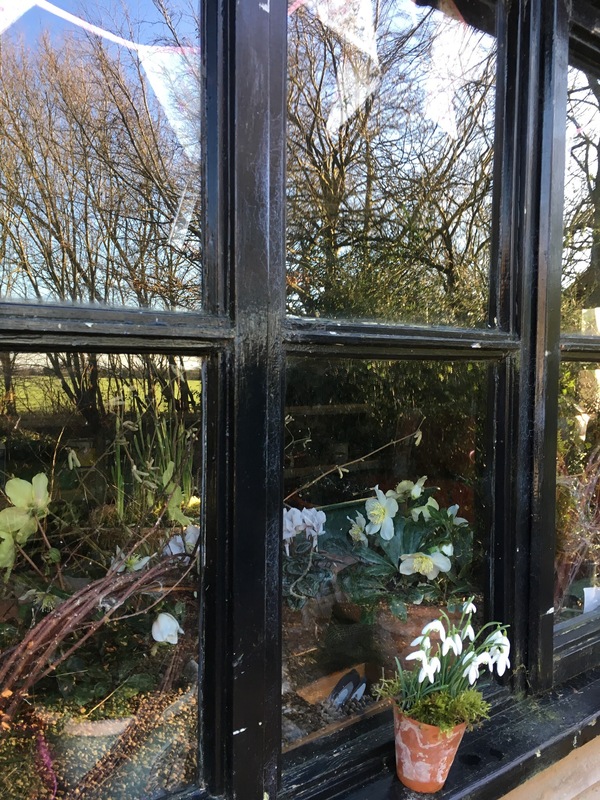 I map the progress of winter through the pottingshed windows, watching the angle of the sunlight as it hits the huge table where I work. 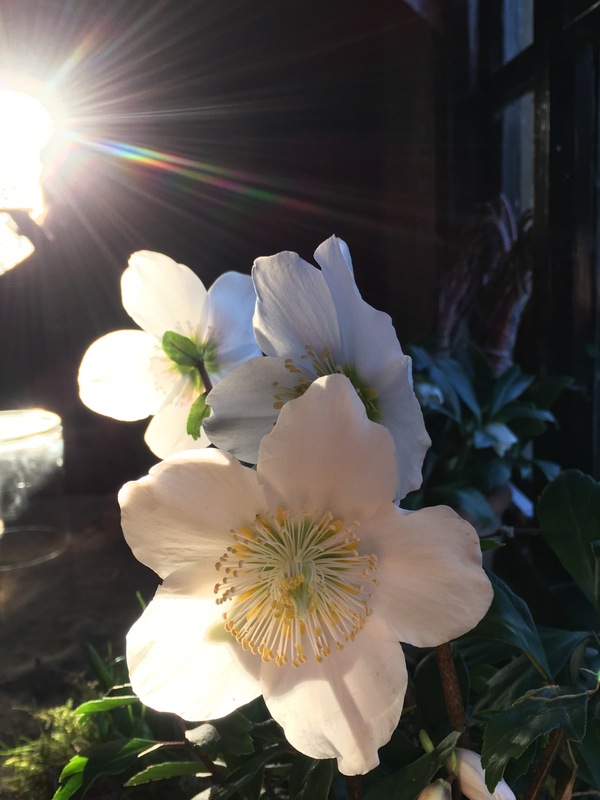 Suddenly there’s a day -usually in the second week of February – when I notice the light has returned to the garden. There’s a shaft of sunlight that shines through the side window like a wake up signal for spring. A kind of sundial for the seasons. It’s a signal for me to reconnect with the world and leave the pottingshed behind. So I make my annual pilgrimage to Hodsock Priory- accompanied by my Mum, as always. And it is a place of pure magic. 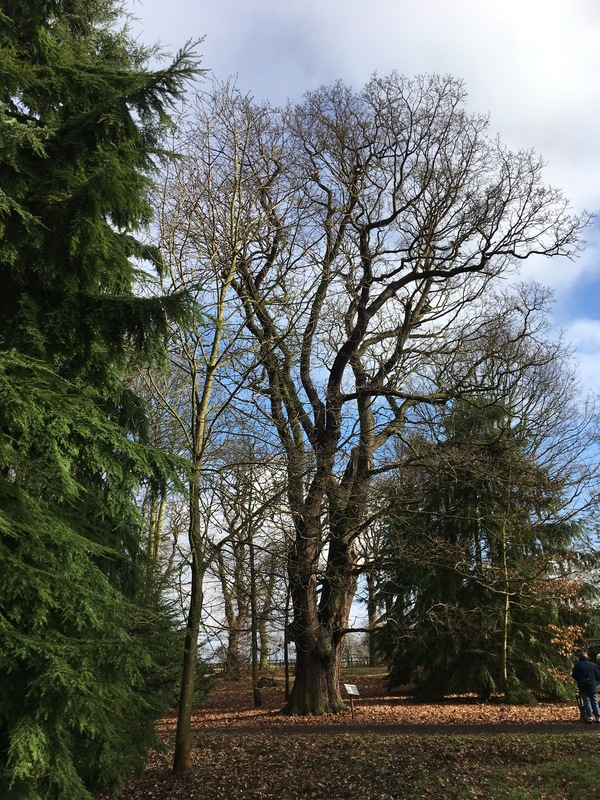 I stand in wonder under a 500 year old oak- the same age as the brick tower gatehouse. We call Hodsock the Chelsea of the snowdrop season. This is the first of many gardens Mum and I will visit over the coming weeks. We are lucky, and grateful, to be invited to the annual press day and enjoy a guided tour of the garden. The woodland walk makes the heart sing. Pyramid-pruned beech trees flank each side of the path. Such a simple idea, and it works, adding interest without being too formal. Pools of colour from the Cyclamen Coum look as bright as stained glass windows in the sunshine. 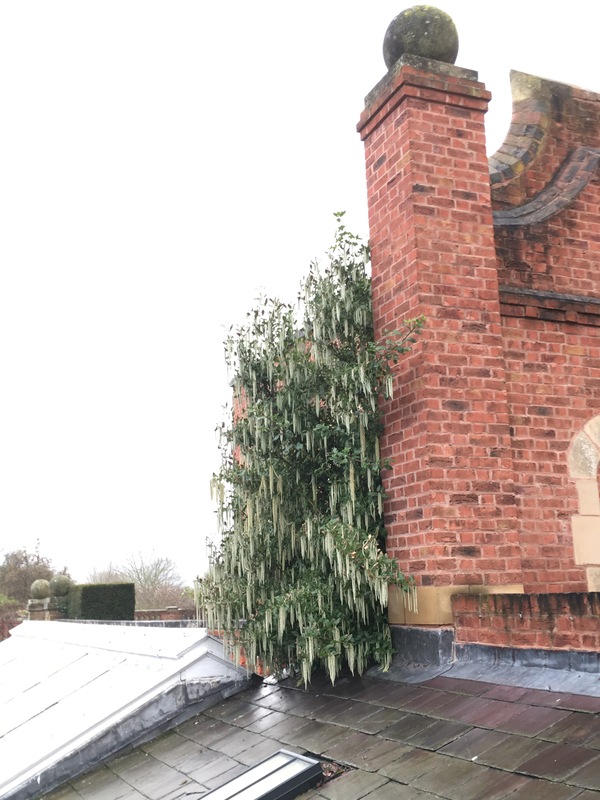 This Garrya Elliptica wrapped around the corner of the house always puts on a stunning display. It has every right to be called the silk tassel bush. We all decide it’s the best we have seen. 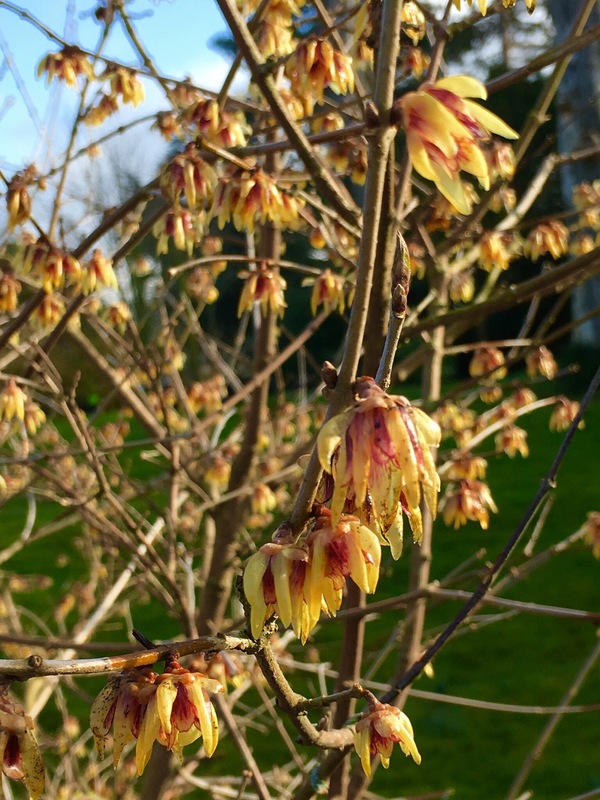 Wintersweet or Chimonanthus Praecox. Glorious Scent is as much a special feature of the garden as snowdrops. I particularly love the winter honeysuckle walk. Lonicera Fragrantissima has such tiny, almost translucent flowers A delicious treat for the senses. We take a new tour around the house and underground tunnels, and emerge in the dry moat. This is a view of the house I haven’t seen before. 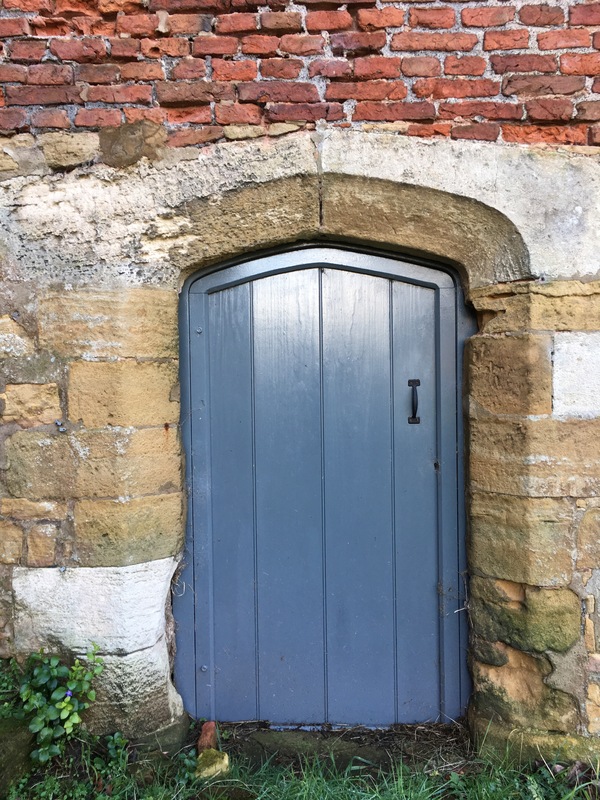 We find an inviting side door to the tower. Amazing to think this stone and brickwork has been here for 500 years. 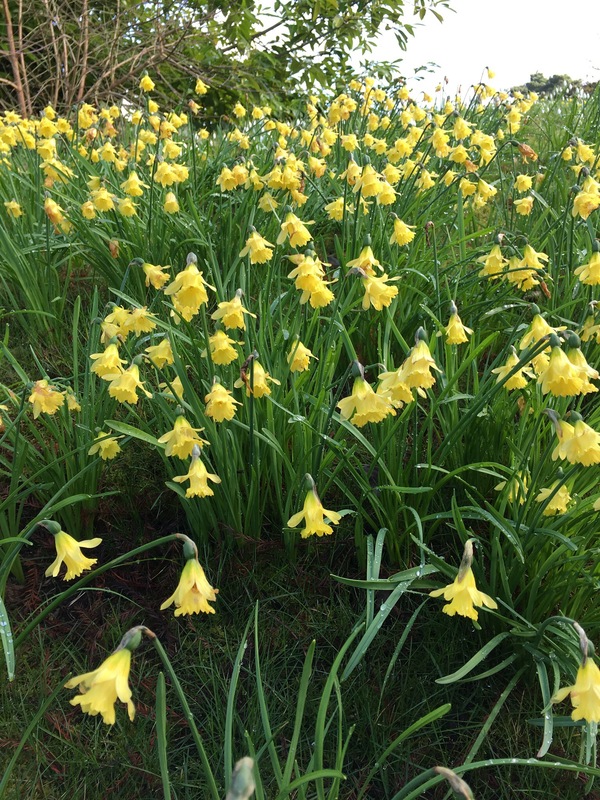 Before setting off for home we find Narcissus Cedric Morris along a bank in front of the house. Such a cheerful sight for mid February. There’s a plant sale at the entrance to the cafe. 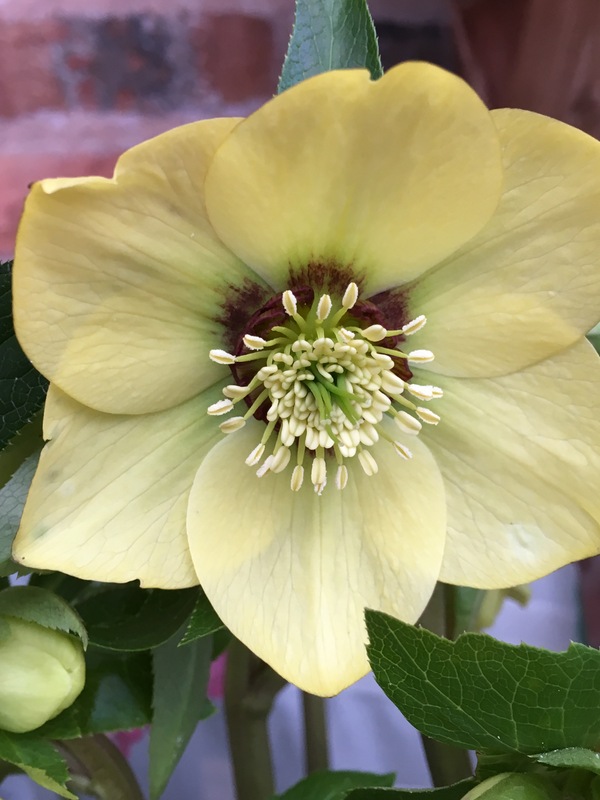 I treat myself to this beautiful hellebore, Harvington Yellow. I’m drawn to the dark eye in the centre. Such a beauty. I shall plant it in front of my pottingshed to remind me of our visit. 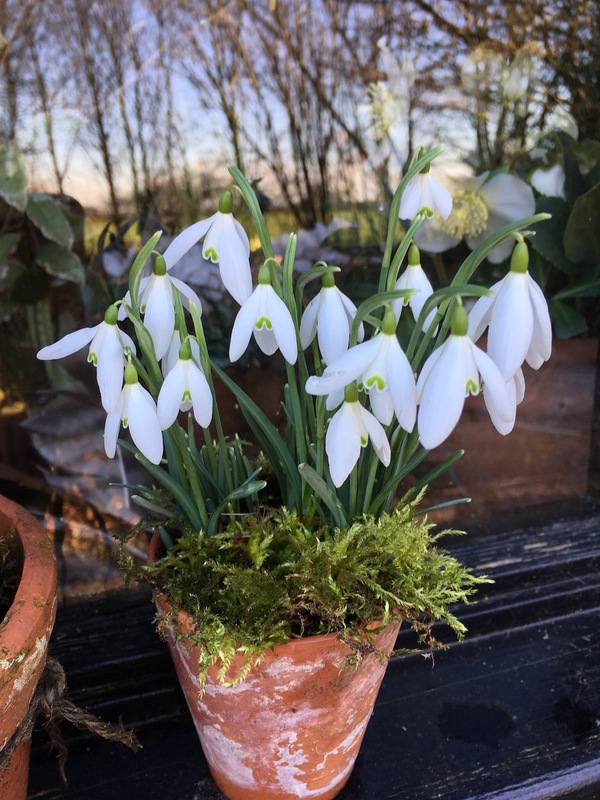 And on the pottingshed window to welcome me home- there’s a pot of snowdrops I bought at Hodsock last year. They are just the common Galanthus Nivalis. But I like them just as much as all the fancy named varieties. They suit the humble setting. 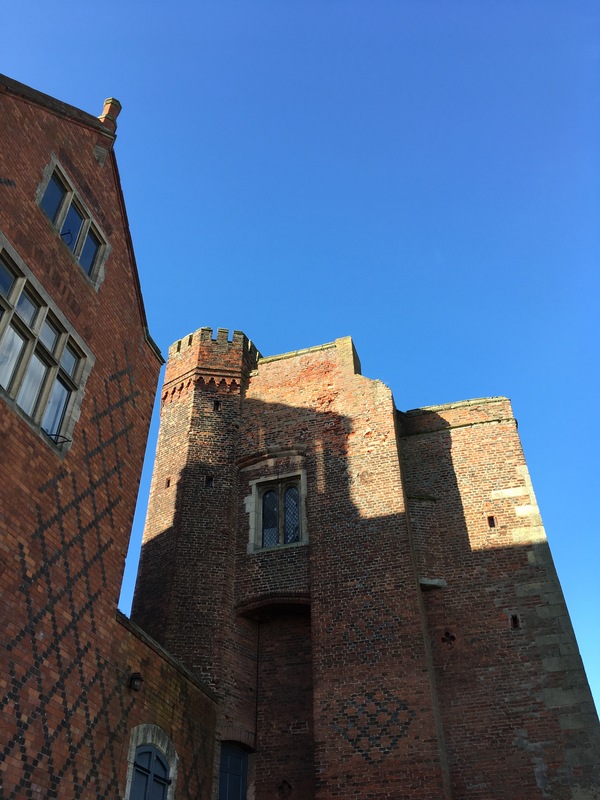 Hodsock Priory is open every day until March 5th. 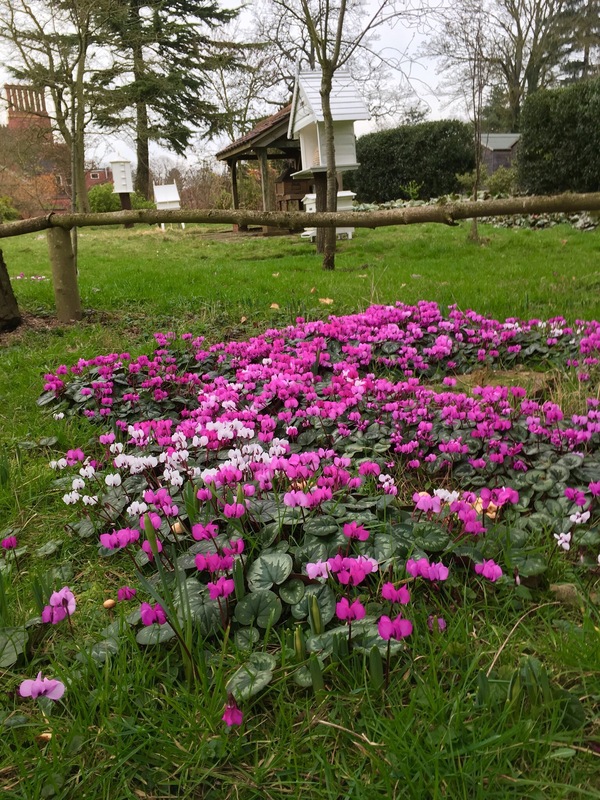 Such a beautiful garden – I loved the bright Cyclamen and your little pot of snowdrops. How wonderful to see this preview of spring…mine won’t look like this for a couple months. Thank you Eliza. It was a day of colour and scent. So welcome in the middle of winter. I’ve planted out the little pots of snowdrops I bought. So I have a tiny “Hodsock” corner at home. Thanks for taking the time to read and comment. It’s much appreciated. thank you Ceri. It may only be a few minutes each day,but there’s definitely a shift. When I get home from work, I can usually run round the garden in the light now- and not with a torch. It makes such a difference. I worked for many years in a room with no windows. I felt totally disconnected from the seasons. It didn’t suit me at all. 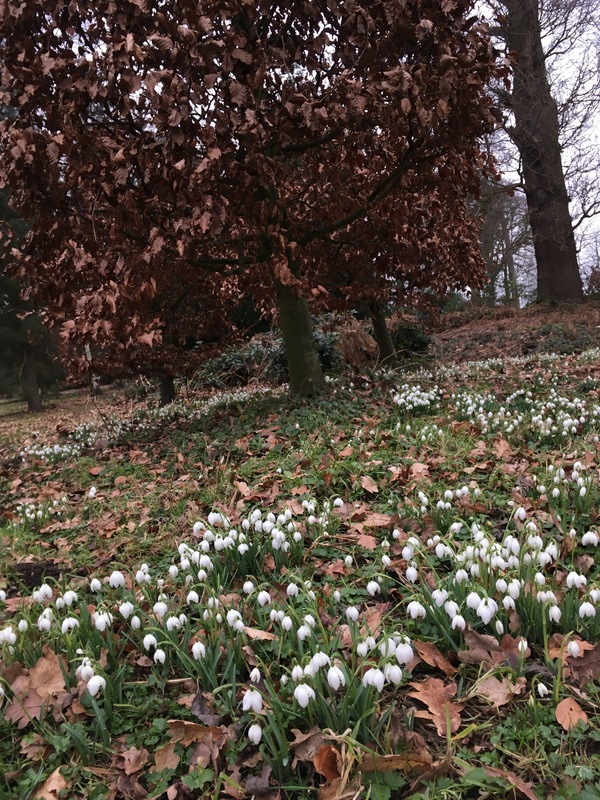 What a lovely visit you had with all the beautiful flowers that are at Hodstock, yes Spring has arrived! Love the views of masses of snowdrops and narcissus, I just wish I lived nearer. The hellebore is beautiful, what an excellent souvenir of this year’s trip! This is such a lovely post Karen, I really enjoyed reading. I haven’t visited Hodsock, and would really like to now. Your potting shed is absolutely beautiful, I love the view you have. Thank you Julie. I can highly recommend Hodsock. I’ve only just managed to give a little flavour of it. What a fab day you had. Nice to see all the other winter flowering wonders too. And that blue sky!! I thoroughly enjoyed your post, Karen. Thank you. I really enjoyed being shown around Hodsock, Karen. What a stunning house and garden. Thank you for the well narrated and beautifully illustrated tour! Your potting shed is a little world of wonders, Karen! Isn’t it great to see the first flowers of spring breathing fresh life into the colour-drained winter.